Good: “We just won a big division game against a rival on the road, and I think there’s a feeling that we could have played a little better,” said Packers quarterback Aaron Rodgers following the Packers 27-17 triumph over the Bears. That’s the mentality you need if you want to continue to work to improve every Sunday, and it’s certainly needed while trying to defend the “champion belt.” Jermichael Finley is officially the NFL’s best tight end. Seven catches and three-scoring hauls proves his dominance as a nightmare matchup for any linebacker or defensive back. Aaron Rodgers – the best quarterback in the league after Tom Brady’s stunning four-pick afternoon in Orchard Park. What a day at Soldier for Rodgers, who was masterful, passing 28-38 for 297 yards and three touchdowns to Jermichael. On top of that, an absolute clinic on how to be precisely precise slinging the rock on the run. Is there anyone better in the world doing that? Even better, he avoided many potential sacks from a fierce Bears defensive front four. Safety Morgan Burnett filled the shoes of Nick Collins, playing the role of a ballhawk with two interceptions of Jay Cutler. The run defense was clearly too overwhelming for the Bears offensive line. The run offense featured by Ryan Grant (17-92, 5.4 yards per pop), was a good sight to see. Needless to say, the Packers won the battle in the trenches on both sides of the line of scrimmage. Jarius Wynn played a rock-solid game, compiling two sacks and offering an excellent interior rush presence. Greg Jennings went the distance with Charles Tillman and fought and jabbed for nine hard-earned catches on 119 well-deserved yards. 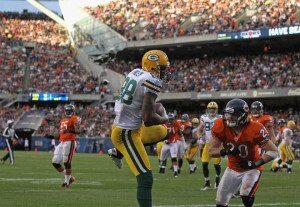 James Jones was rewarded with some playing time; going for four receptions and 24 yards. Time of possession was won by nearly 15 minutes. Bad: Starting right tackle Bryan Bulaga suffered a bruised left knee injury. James Starks had a rather down day – 11 carries for only five yards. Other than the long of eight yards; just -3 yards on ten rush attempts. Johnny Knox had a punt return for touchdown which was way too easy, and luckily a hold call nullified it despite the penalty not affecting the run back. Special Teams caught a break on that one – something to keep an eye on further down the road. Next: 3-0 Packers vs. 1-2 Broncos, 3:15 PM CT.
More quotes to note: “We have things to work on and we’re still trying to steadily improve; we’re not satisfied by any means,” Jennings said. “I think we have the potential to get better, and I don’t know how many wins that means or the playoffs or whatever, but I just think we can play better football,” he said. 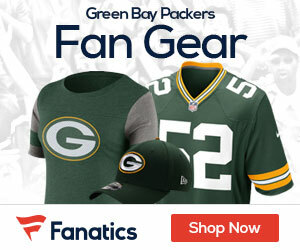 “The standard we’ve set around Green Bay is excellence, so until we’re at that point, there’s going to be a lot of hard work during the week,” Rodgers said. All in all, it’s a great example of not being content and staying hungry in attempt to repeat as champs. What more could you ask for? 1. We shut down their running attack and pretty much dominated the game. 2. Our LB’s, mainly Hawk, Bishop and Walden, have been poor versus the pass, even in obvious passing situations. Why not put in faster players-Lattimore and So’oto on obvious passing downs. P.S. : Our LB’s helped shut down the run. 3. Has Collins been put on IR? If so, I didn’t see it happen and am wondering who we’re going to add to the 53-man roster and practice squad (if player is added from the practice squad). 4. Donald Driver has been invisible. No catches. He should’ve been released and we should’ve kept either Chastin West (Jacksonville) or Tiri Gurley on the 53-man roster. 6. James Starks was held to 11 yards on 5 or six carries…Ryan Grant had a few excellent runs and ran hard…he is a one-cut back. 8. Who will we add to the 53-man roster once Nick Collins is officially placed on IR?